Demographics may be a long term theme but I believe it very much has relevance in trying to work out what’s next for the markets. US demographics turned around 2000. Here we see US GDP changed trend around the same time, and with US demographics negative for this decade, that trend should continue. To be clear there are large oscillations within that but the overall pressure is down. 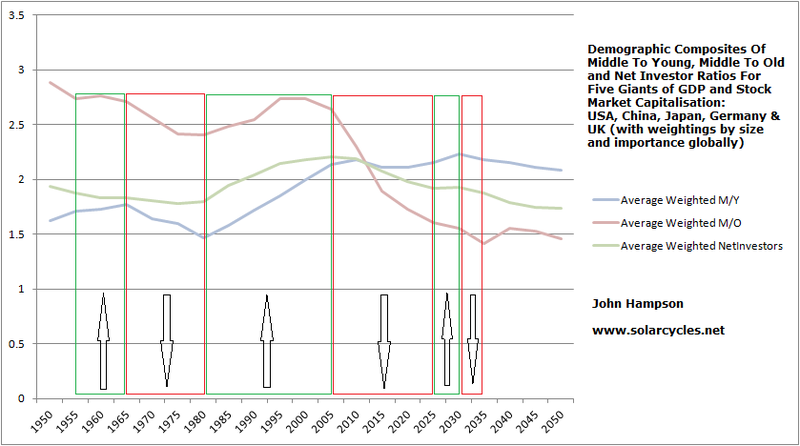 Here is my demographic (weighted) composite again for the main 5 economies of the world. The Fed is targeting 2.5% inflation, but the demographics say this is unlikely to be achieved. 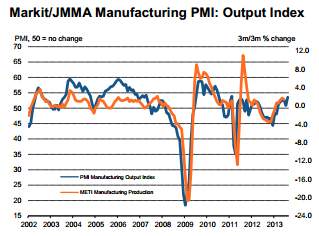 Also, GDP is going to remain weak and central banks are going to need to maintain intervention. The latest US inflation rate came in at 1.5% annually. This is lower than most current treasury yields. The Fed wants inflation to be higher than yields in order to reduce its ballooning debt (by inflating away). Bond yields may still be historically low, but the demographic trends in place mean that inflation is low and growth is low. It wants to stop yields rising to 3% for fear that this level would be enough to tip a weak economy and to prevent it entering a deflationary trap where bond yields exceed inflation. Indeed the Fed’s Bullard has said that if inflation dropped to 1% annual he would want QE to be increased. Which brings us to commodities. Can they rally? The demographics are largely against, as demand should erode and hard assets perform best in inflationary trends. On the flip side, the easy money conditions mean a loss of appetite for stocks could see money flows into commodities in a speculative momentum rally. History would suggest they probably can as late cyclicals, but history has not seen this collective demographic downtrend before between most of the major economies. If I was to advise on a buy-and-hold portfolio for the next few years (I am not an advisor, don’t follow me etc) it would look something like this: long japan equities (positive demographics for stock market), short usa/europe/china equities (negative demographics), long gold (go-to asset as anti-demographic), short energy, short real estate, long cash with bias to asia currencies (all deflationary). Russell Napier believes that there is trend-following in place in equities currently, but that eventually perception will turn to how QE and ZIRP have failed over 4 years to return the US to normal growth and stocks will turn bearish. I agree that this will happen and see developments ahead that can force it. If the US pulls back on government spending (debt ceiling 30 Sept) or stimulus then earnings should decrease (as per recent post) and yields should rise further, respectively. If commodities make a speculative rally they are likely to tip the weak economy over, and if they continue to decline in a deflationary trend then US inflation is likely to fall yet further beneath bond yields. In short, the Fed is in a trap, and it is a demographic trap, and a particularly potent trap because of the collective demographic downtrends amongst most developed countries, making for a downward global pressure. I don’t believe it can create sustained inflation or normal growth UNTIL demographic trends change. Collective demographics do start to improve once we get to the end of this decade, but over the next couple of years I believe there is really no way to avoid a global recession and harsh nominal stocks bear. Either yields, commodities, reduced goverment intervention or increased government intervention should tip a fragile economy over. What does that mean for trading? Well, for me personally, I like to play an asset one way, siding with the longer term trend. If it goes against me nearer term, then I can use money management and averaging, with the conviction the longer term trend will ultimately drive it. So my anchoring would look something like that imaginary buy-and-hold portfolio I posted just above. 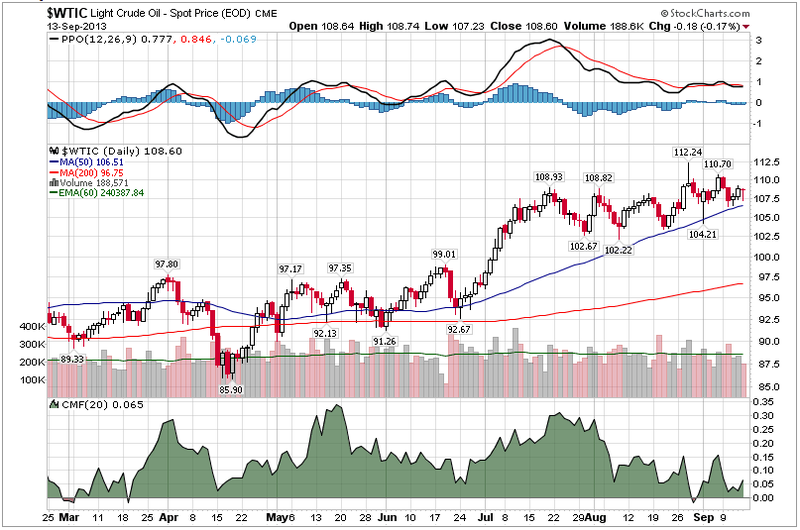 Right now I am long energy (oil and gas commodities) which is a concern if deflationary trends dominate. However, solar cycles / historic topping order / easy money speculative conditions may yet deliver the decisive rally that I seek, so I’m going to carry on holding for now. With equities I am looking to build on the short side from the current position but am looking for more evidence of stocks topping. The technical action of the last few days has added weight to this, but we still don’t have ‘enough’ all round evidence. But this is trying to be as accurate as possible with timing, for the yearly trading P&L. I have sold my other longer term equity-related investments over the last couple of months and moved them to cash. As various stock indices were at important breakout levels, and ended Friday retesting those levels (having jumped above then fallen around the FOMC), then a breakdown in the first part of this week would make things look more bearish, because we would have a shooting star fake-out and more of a trend supporting lunar / equinox reversal. 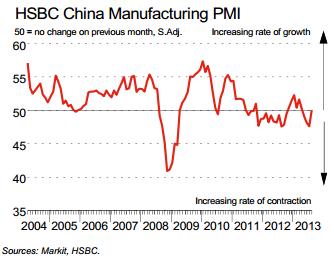 Leading indicators remain overall positive. 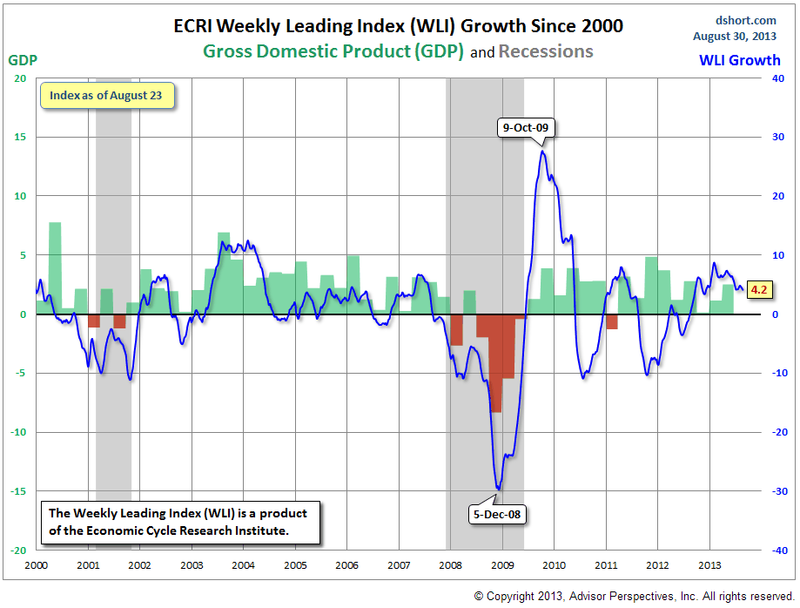 For example, US CB and ECRI leading indicators were both good readings last week. This is supportive for stocks. On the flip side, we have seen some breadth divergences, which would be one topping process sign, and we know margin debt is at lofty levels. Here is the latest geomagnetism forecast (with lunar oscillation). Overall flattish, but with a slight upward bias. I noted previously that the lunar positive fortnight from today plus the relatively benign geomagnetism could make me long-biased. However, if we have seen a lunar inversion then we could see down rather than up this week, which would negate that edge. Hopefully it is evident from the two charts combined that commodities have the potential to break into a bull rally here. However, it is just potential, and time is of the essence. If the CRB is to break upwards then it has to make the current backtest of the breakout stick, and pull upwards from here. Here is the US dollar index. See how it has arched over and is now threatening breakdown. 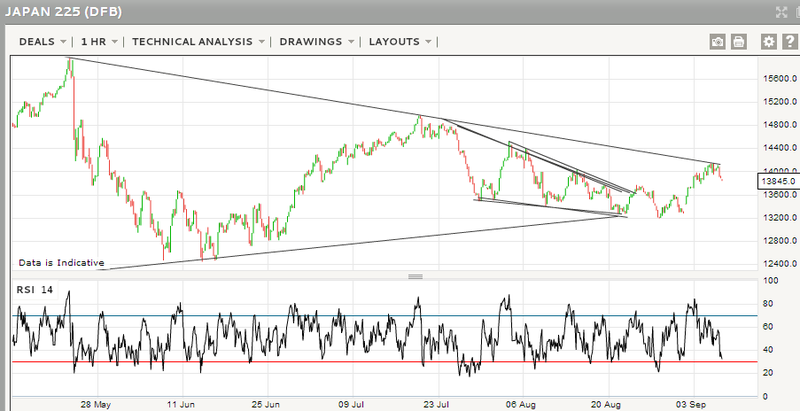 A bearish break would benefit commodities and provide one ingredient for that potential rally. As the Euro is the biggest component of the US Dollar index, that then is a possible breakdown catalyst. The most bearish assets (in terms of public opinion) of the current period are corn, wheat, oats, soybean oil and coffee – all agricultural commodities. 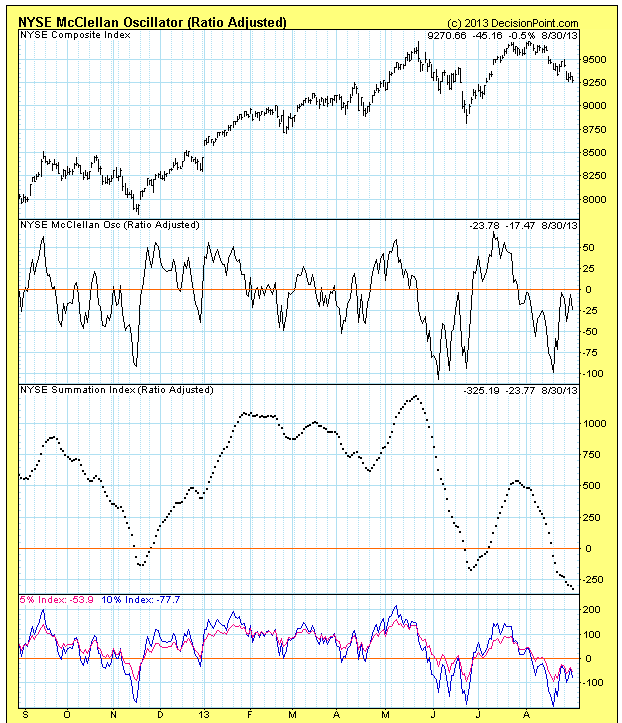 The volatiility index for stocks (Vix), and treasury bonds, are down with them at bearish extremes. So, if we are to see a mean reversion – which is likely, but the timing is the difficult part – then it would be into commodities and out of stocks (Vix rises). Lastly on commodities, my solar maximum correlations remain potentially in play, if the smoothed solar maximum is ahead of us. Sunspots are back up to the 100-mark currently so the sun is showing some life again, and certain analysts predict another sunspot peak ahead around the turn of the year. I have established that experts typically agree on the solar maximum once the solar magnetic flip is complete on both poles. The sun’s north pole switched polarity in May 2012, but the south pole flip is still ahead and likely within the next few months. So we should know for sure by Q1 2014. Either an end of year sunspots rally will produce a new smoothed maximum for SC24, before the final polar flip, or the pole will flip and Feb 2012 will be cemented as the solar max. By my research, a commodities rally over the next 6 months to a new index peak would fit with the former, not the latter. In summary, the research for this post has produced a bias against stocks and pro commodities. As you know I am long commodities so disclaimer as always. However, I was also net long equities and have taken some profits on the long side. 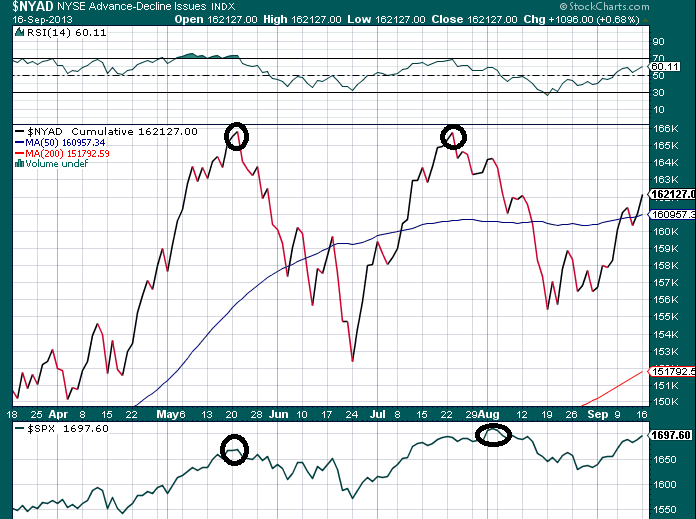 If stocks rally to new highs this week, and on good breadth, then much of the bearish case would be negated. If commodities sag further into the end of September, the rally potential in the commodity indices would fade. 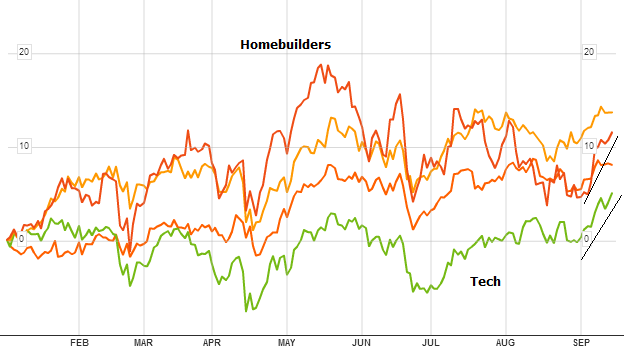 Homebuilders, another early cyclical, have also pulled up sharply. The other two shown are materials and energy sectors, late cyclicals, which over the last week have underperformed relatively. This casts some doubt on the topping process. Now if breadth rebounds and takes out that double top it would negate this, and I’m wondering whether that’s what may now occur. Following the FOMC output tomorrow, we have 2 weeks of positive lunar pressure with a positive geomagnetism forecast to accompany. As per my speculation, I wonder whether taper-light with supportive wording will be the catalyst for a breakout in global indices and a 2 week rally, pushing any topping process further out in time. It’s a difficult call because, to be clear, there are indeed some warning signs. If European and Asian stocks are turned down away from those major resistance levels, and the SP500 and Dow turn back down into their ranges, then technically a topping process will look more compelling. Margin debt is frothy, put/call ratios are frothy, certain indicators of Martin Pring are on the edge. But, new highs – new lows do not signal a top at this stage. We don’t as yet see excessive rises in oil or bond yields. 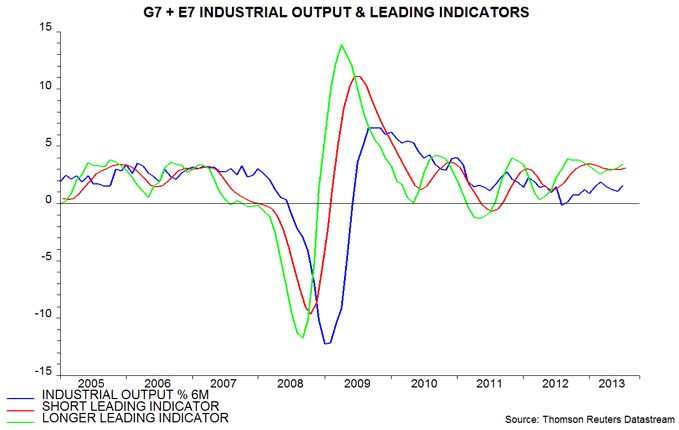 Leading indicators continue to point to broad sufficient strength into year end. Economic surprises for emerging markets have turned positive. In short, I am wondering whether a topping process in equities is going to be postponed for now, and we see another breakout rally first. If we see degradation in leading indicators, sharp rallies in oil or bond yields, or the US pulling back too sharply on QE and government spending (debt ceiling) then I would feel more confident predicting a top. For now things look too benign. Of course the Fed could surprise us tomorrow with an aggressive taper programme, but the continued relative historic weakness in the economy does not support it. I side with the historic norm and predict rallies in oil (inflation) and bond yields will tip the economy and equity markets over in due course, but at the moment neither are threatening enough. If that scenario doesn’t occur then I predict demographics will tip the economy and asset markets into deflation, with the help of the Fed pulling back on QE/spending. So, the former would be an inflationary tipping into recession, the latter a deflationary turnover. For now though, whilst there are warning flags, we don’t appear to be sufficiently down either path to tip equity markets over. Your thoughts? He suggests it is not the real oil price level per se but a ‘shock’ i.e. 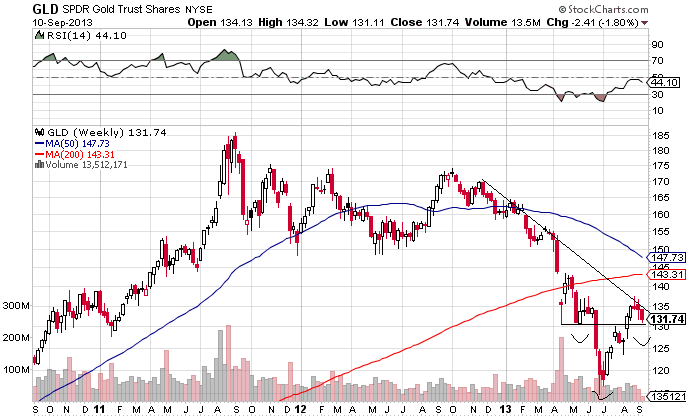 a big, fast move up in price that brings about a collapse in GDP. From a technical perspective, the potential for such a swift rise is there, as crude has broken out of its triangular consolidation to the upside. A break above the 2011 high of $115, which is within reach, could be enough to produce the speculative spiral that has been behind previous parabolic rises. Zooming in on the nearer term, a fairly messy range has developed over the last six weeks, with the contract buffeted about over Syria. With inventories still above historical averages it could be interpreted that there is a lack of appetite to buy higher than this range, and clearly there is a risk that this stalling in momentum gives way to a breakdown. However, for now, the price continues to edge upwards and a bullish intraday reversal candle formed on Friday. So let’s see what happens this week. What if exponential technological evolution more than offsets negative demographics? I.e. what if rising corporate profits thanks to technology-driven gains can spur the stock market higher, maybe exponentially higher? The employment to population ratio has also fallen sharply. Companies are making more profits but employing less people and paying them less. Technology is one key factor in this: it is cheaper and more efficient for companies to increasingly employ tech over people. 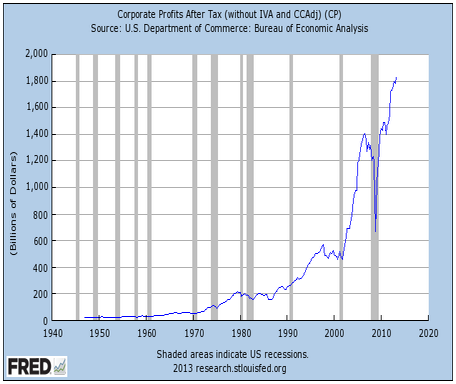 As we are concerned with the stock market, are the corporate profits what matter? Well, more unemployment and lower incomes means lower demand in the economy. Hence we have seen a consistent theme in recent earnings seasons of revenues disappointing versus earnings: companies not making profits through demand but through cost savings. It is the government defecit. Government ‘spending’ (stimulus programmes, cutting overnight lending rate to banks to zero, etc) has been the major factor since the 2008 crisis in pushing up corporate profits. 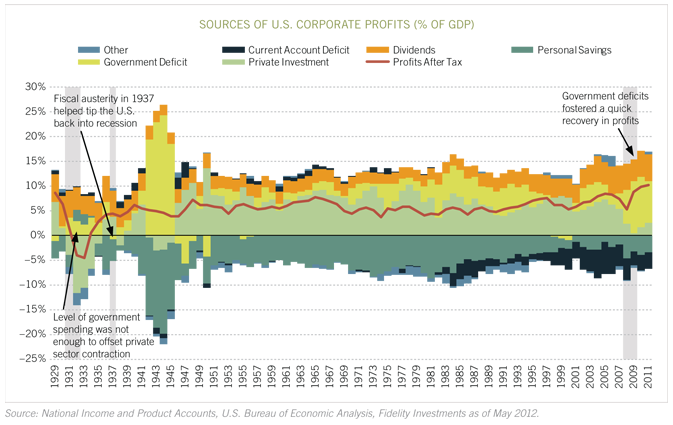 Those corporate profits are real, but at the expense of increasing public debt. So the US government wants to cut back QE when it can, and facing the debt ceiling again – another ‘fiscal cliff’ – it needs to cut back spending and make savings. It also wants to keep rates low, ideally lower than inflation, to reduce debt servicing and shrink the debt, so current rising yields are a threat. 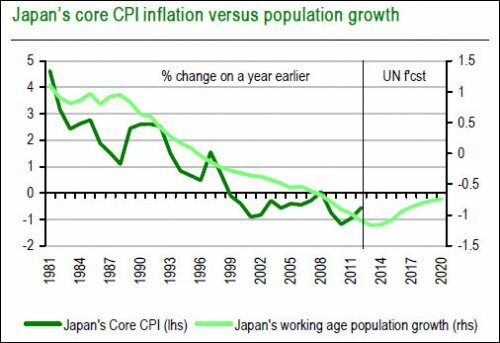 Extracing from that Richard Koo PDF again, Japan only fell into deflation once it had fallen off the fiscal cliff, following an attempted fiscal consolidation. Additionally, drawing together several pieces of research, it turns out corporate profit levels are only important in stock market returns over long timescales, e.g. a 10 year view. Sentiment is the main market driver in any one year, and p/es are the main driver if trading say on a 2-3 year timescale. By my work p/es are relative to demographics. A p/e of 20 is not expensive if the demographic trends are strong and positive, and vice versa. So, I can now come back to the opening question of whether tech evolution can push up corporate profits and in turn the stock market, and offset weak demographics. Tech can enable cost-cutting but this can be at the expense of people, resulting in lower demand in the economy, so it’s not just a simple win, it cuts both ways. 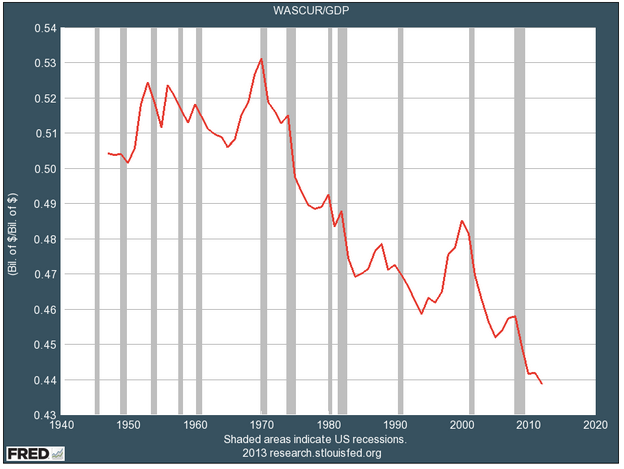 Furthermore, recent record high corporate profits are shown to be mainly due to a transfer of wealth (debt) from the Government, and the risk to future earnings is in Government action to cut back QE and savings to deal with the debt ceiling. But ultimately, corporate profits don’t matter so much for the stock market, only in long term investing. Sentiment can push the market one way or the other ‘irrationally’ before p/es and demographics come into play, before corporate profits. In summary, I am still of the opinion that we do not have a new ‘secular’ bull market in stocks underway and that once ‘sentiment’ gives way, the collective demographic downdraft will help topple the economy and stock market. Action on QE and in response to the debt ceiling could be a catalyst for future corporate profit disappointment, which could help tip the sentiment. Crude oil, meanwhile, could do the job all on its own, if ‘some development’ provides the impetus for a speculation move into the commodity. Exponential technological evolution is a real phenomenon and I believe is ‘the great hope’ for humans to deal with the debt, resource scarcity, global wierding, demographics, overpopulation and other challenges. But I don’t see evidence that it can drive the stock market ever higher versus these phenomena in the shorter term. Time for a more in-depth post. By my work the secular (more accurately demographic or anti-demographic) asset class should be bid to a peak in a solar-inspired speculation blow-off close to the solar maximum, which for this solar peak should be commodities to round off a decade long (plus) bull market. If the smoothed solar max has passed and was Feb 2012 and the CCI commodities index made its ultimate peak April/May 2011 then neither should now be exceeded. If this turns out to be the case in hindsight, once the solar max has been agreed, then the commodities peak would have occurred 9 months prior to the solar peak and would within normal parameters to continue to validate the theory. 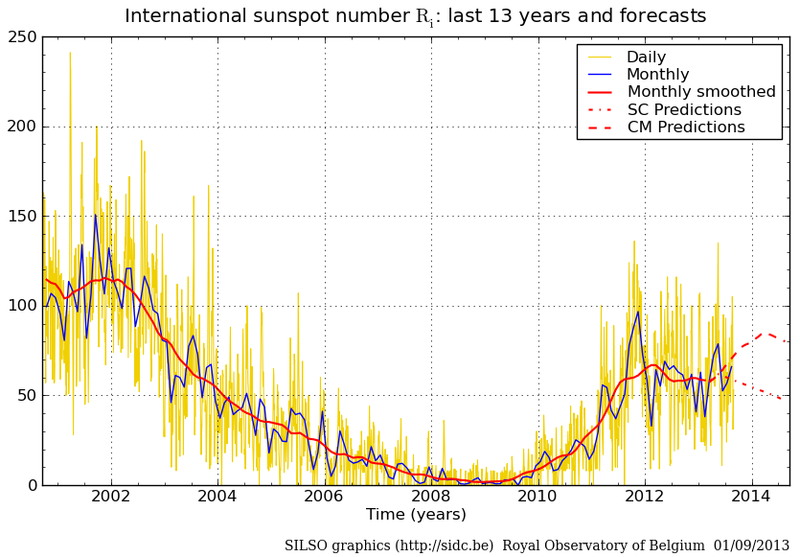 If, alternatively, the solar peak is ahead late 2013 into early 2014 (which is SIDC’s second option, and also Leif Svalgaard’s prediction – shown below), then that 2011 CCI peak is too far away and if the theory is correct we should get another commodities peak closer to the solar peak, which would mean a higher peak in the CCI ahead. We have the possible seed for this in a fledgling CCI uptrend following a base established in July/Aug 2013 together with their historic performance as late cyclicals in what is possibly a cyclical topping process in equities occurring. 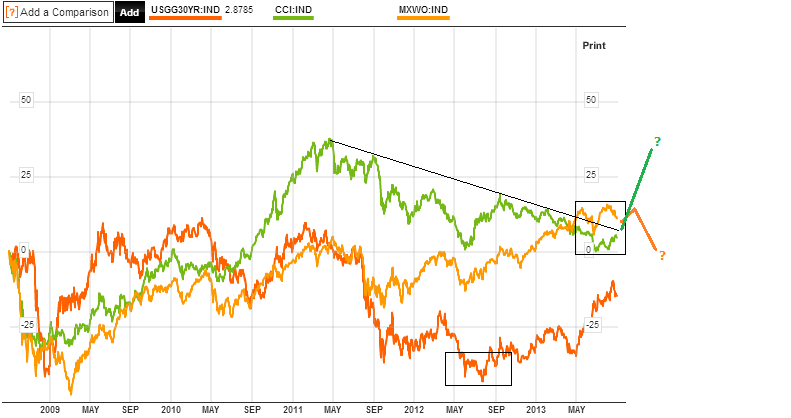 However, this CCI uptrend is currently tentative, devoid of momentum and without broad participation thus far. The dips in oil and precious metals at the end of this week cast further doubt for now, but their drops coincided with money flowing back into equities. If equities are in a topping process then money should flow back to commodities in due course as they go outperform as late cyclicals. I would suggest the higher peak in CCI to be possible as speculative money pours in, under these easy money conditions globally. ZIRP and QE may not be able to generate growth but they can generate bubbles. If the first alternative turns out correct, and both the solar peak and commodities peak are behind us, then historically we have seen a new long term bull market in equities underway at this point, and the current easy money conditions could spell big momentum into equities (which would be the polar opposite to the second alternative of equities in a new bear and commoditites sharply rising, thus vital to call correctly). However, my demographic research shows that this is unlikely to be the case, at least not yet, as the positive demographic support for a new global secular stocks bull is absent. Indeed, the collective demographic trends of the major economies, bar Japan, are in an unprecedented collective downtrend. In a nutshell, QE and ZIRP aren’t that potent as they cannot force people and companies to borrow or spend or invest. In the 1990s Japan tried to offset demographic downtrends with QE and ultra low rates and other stimulus tools. Even though most of the major economies were in demographic uptrends in that period (with booming asset markets and economies), this positive global environment AND these central bank actions were not enough to get people and companies to borrow, spend or invest. 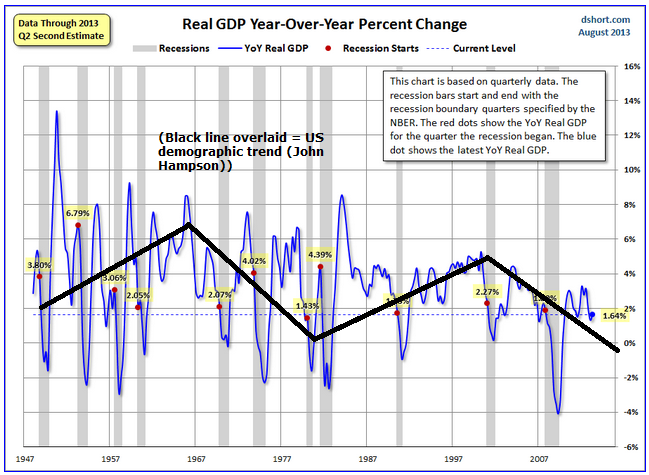 The yellow dots reveal that real US GDP is currently lower than any previous recession start point. 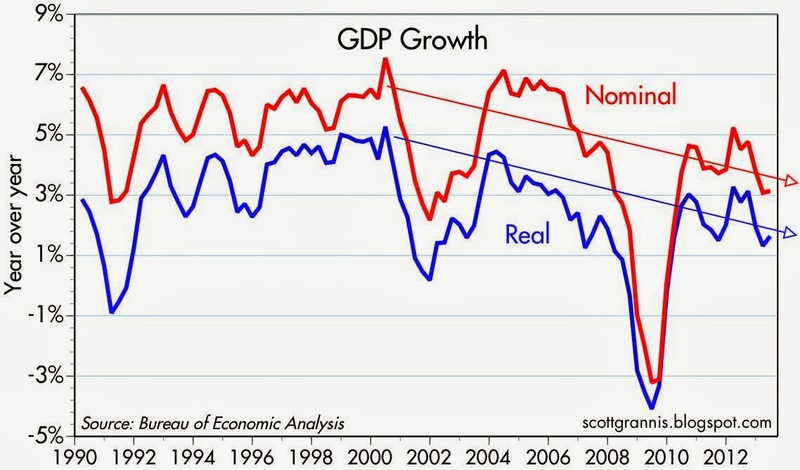 I suggest this shows the relative impotence of QE and ZIRP, and would argue that the demographic downtrend which should be in place for the bulk of this decade, suggests that real GDP growth level should fall negative again in the near future and another recession kick in. The question is whether this occurs with or without the tipping help of a speculative rally in commodities. 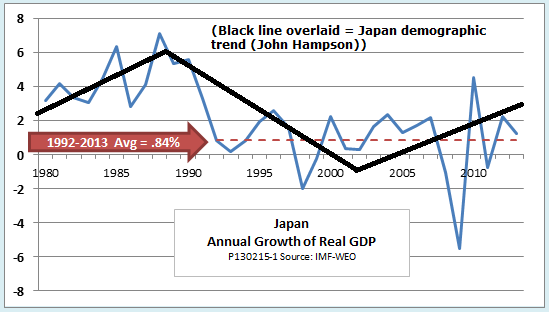 Here is the same for Japan: real GDP growth versus overall demographic trend. Note that both should be feasible by demographics alone, without ‘Abenomics’. 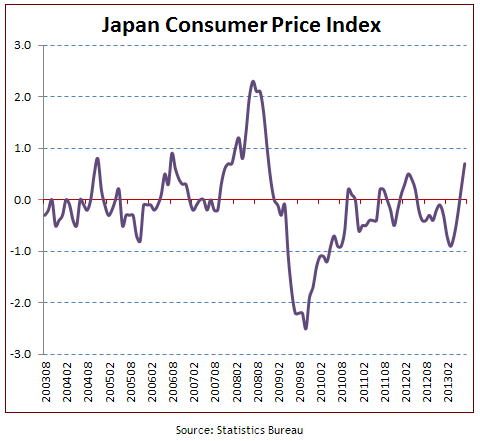 The demographic trends for Japan mean that we should see underlying growth, price stabilisation, and rising asset markets, which I believe will be touted as positive results of Abenomics when in fact largely written by the demographic change of trend. The line you can see coming into picture at the very top is the 2-decade declining resistance, the containment of the long term bear. I believe a retest of this should be on the cards and I have decided to add to playing Japan equities on the long side. However, if US equities are in a multi-month topping process and soon to enter a new cyclical bear market, then I would not expect Japanese equities to go their own way, only rather to relatively outperform, which would mean decline less. Nonetheless, a new bull market in Japanese equities is belated relative to demographics and I feel happy here trying to make profits on the long side – expecting any downside is more limited than other markets – whilst still trying to assess where US and global stocks are headed. The supporting evidence for Japanese equities to rise should come in real GDP, real economic improvement, and indeed an underlying bid in Japanese risk asset markets. So I will continue to watch the data releases. 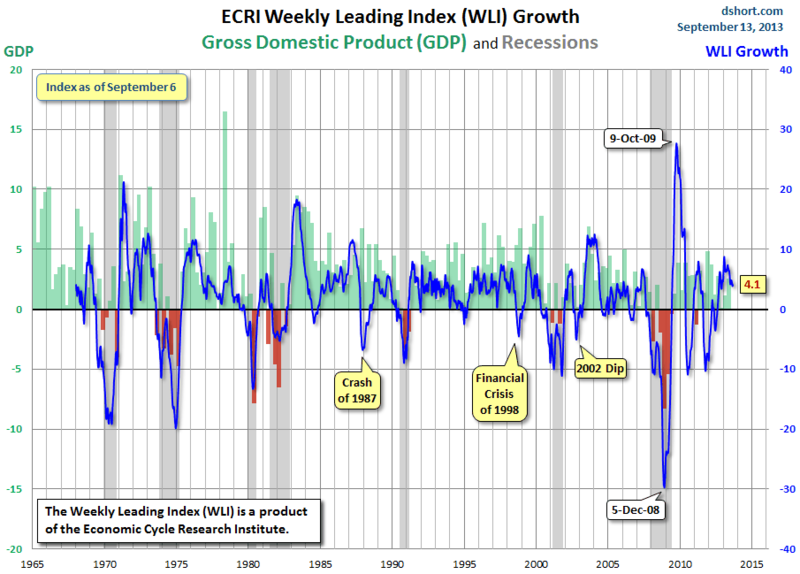 ECRI leading indicator growth fell beneath zero prior to each recession shown in grey. The break into the negative often historically occurred close to the stock market topping, with stocks typically being a leading indicator of the economy. We can see there have been several breaks beneath zero that did not give way to a recession, not least the fairly deep fall in 2011 that helped ECRI (incorrectly) announce a recession. However, my take on the current reading of 4.1 is that we should see this fall towards zero if we are to see a cyclical bear erupt in equities and a recession to occur ahead. This growth measure has been in a declining trend since early 2013, so to add weight to an equities top being formed, we should continue to see this dropping. For now though, this leading indicator, and other leading indicators (such as Recession Alert or Conference Board) point to continued economic growth into year-end. Weak but sustained growth and low rates are typically a good environment for equities, which would be a framework for equities to move higher and reveal the consolidation since May as digestion in an ongoing cyclical bull. In supportive of this, the Nasdaq is now convincingly at new highs for this cyclical bull, and the Dax is back testing its high-to-date (which is also the all-time nominal high). If other indices break up and away from the ‘topping range’ then we would be looking to 2014 for a cyclical top as a multi-month topping process would have to start over. As noted in a recent post we have some evidence for a topping process in play since May, but also some normal signs missing. This should be resolved one way or the other soon. Which brings me to the two main threats to the economy and the equities cyclical bull: excessive inflation from sharp rises in commodity prices and/or excessive tightening from rising rates in escalating bond yields. Bond yields in the major economies continue to rise albeit from low levels. If economic growth persists further and the Fed begins to taper QE then we could expect yields to continue to rise. Historically, the tipping point has been when 10 year treasury yields hit 6%, however today’s demographic and debt interest pressures mean that trouble level is likely to be lower. 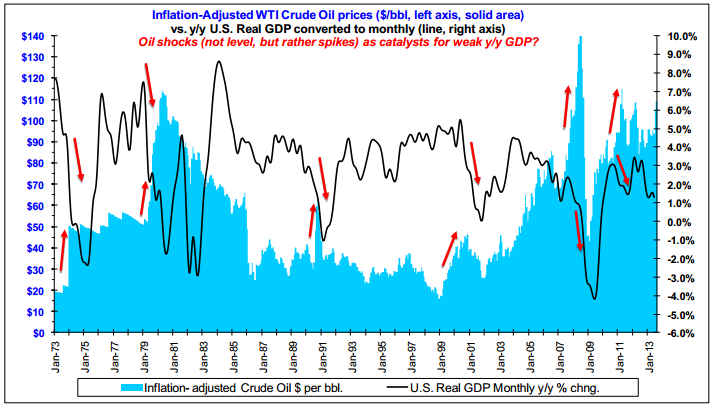 Regarding commodities, the most important is oil, as quick major escalations in oil prices have historically correlated with tipping the economy into recession, due to its importance as an input in so many processes. 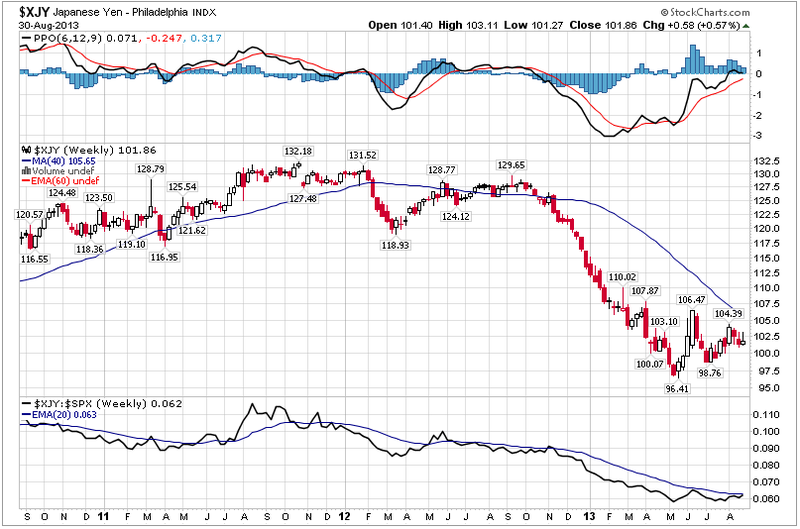 Despite the slack and weakness in the global economy, crude prices have hung around the $100 level the last 3 years. A speculative move into this asset, for any number of reasons, could under current easy money conditions swiftly lead to $125 oil, which I believe would really test a demographically-challenged weak global economy. On the flip side, the same demographic trends could further erode commodity demand and also limit the exit from bonds. Further commodity price drops, together with yields stabilising relatively low, would again provide the backdrop for equities to march on and economic growth to persist – unless the potency of the collective demographic downtrends drag the economy down into recession on their own. If Martin Pring’s normal historic topping order is playing out, then we have seen the top in bonds already, we should now see evidence of equities topping and of a transfer in momentum to commodities which should make a peak last as the economy rolls over. This would imply yields and commodities rise despite demographics, and for my work this would be a better fit if the solar peak were still ahead at the turn of 2013/14, with commodities making a final and bigger peak in the months around that. I believe evidence in support of or against this could become clearer as soon as next week, watching the markets’ reactions to the FOMC output. Some mild tapering is being widely touted as a done deal, but the size and the wording we don’t know. Regardless, I expect a big reaction in the markets and it will be telling how commodities, precious metals and the US dollar, fare afterwards. If commodities are going to make a final big rally then the tentative uptrend of the last couple of months should cement and a US dollar breakdown out of its long term triangle (see HERE) would be a great partner for such a development. We are over 3/4 of the way through the year and my PnL is currently showing my worst year of performance to date since going full time, due to the run against commodities longs this year, particularly precious metals. This would repair itself if commodities did begin an uptrend in the last couple of months and now continue into year end, but it could yet go worse if they are in a bear market since 2011 and have further falls ahead. So I have decided to use the Autumn to do what I can to make sure of a good result by year-end. This means I am going to add shorter term trading to my game in this period, whilst running the more medium-term-focused global macro positions. Short trades are something I’ve done before, but not for some time due to success (and personal preference) with the longer term methods. So, I just wanted to share with you that this is what I’m going to be doing different. I am looking for liquid markets that I can play more aggressively for quick gains. So I am looking for candidates amongst the major markets that I can play confidently repeatedly either long or short (i.e. fundamentals/technicals align in favour of one way or the other), and this will include increasing exposure if movement goes the other way. One such play-thing is going to be the Nikkei on the long side, as mentioned above. I am going to pour over some other markets (stock indices, commodities, fx) to find others that I consider suitable, so will share when I decide. You may disagree with my choices and indeed the method, but I’m just sharing what I’m doing, and will let you know the results. One last thing. Almost all my money is in sterling and I am looking to transfer this to Euros, now I am in Austria. The EUR-GBP exchange rate has therefore become part of my daily watch. A one cent movement in either direction makes a massive difference when considering the amount I am going to be transferring and getting this ‘right’ is as important as my other trading, in terms of the impact on my wealth. So I’ll share my current thoughts, but if any reader is more of a regular in the FX market, please step forward and share your knowledge. EURGBP has been in a large declining channel since the start of 2009, with the last 3 year snippet shown below. In July of this year the Euro tried to break out, as the Eurozone recovery became more apparent, but it turned out to be a fake-out, and recently UK economic data has surprised to the upside, which has helped not only turn it back down into the channel but also break down beneath the rising Euro support shown. The Pound is fairly overbought now versus the Euro and EURGBP spent last week trying to base. However on Friday there was a further breakdown in favour of the Pound, taking the pair beneath 84. The latest UK inflation data is out this coming week which should influence the pair one way or another, however I believe that ultimately the Euro can drop further here against the Pound, given the technical developments and the change in the fundamental backdrop, and I’m going to hold out for 82- at this point and will review. Which brings me to the big question of whether central banks can offset negative demographic trends in the advanced economies, and this is the subject of a new paper from the IMF (click HERE to read, hat tip Gary). They conclude that demographics do indeed affect unemployment and inflation and central bank policy therefore has to be more aggressive and more unorthodox to offset this. Holding rates at zero and running large QE programmes could be deemed aggressive (in the former) and unorthodox (in the latter). If these actions and collective central bank actions across the globe have offset demographics ‘enough’ then we ought to see enduring strength in coincident and leading data. Regarding coincident data, US economic surprises have broken upwards and are strong positive (whilst emerging markets have been steadily rising and are now just beneath zero). This picture could provide the grounds for a reduction in QE at next week’s FOMC output. If the Fed tapers, then we could see precious metals further punctured, the US dollar rise, and treasury yields jump further. 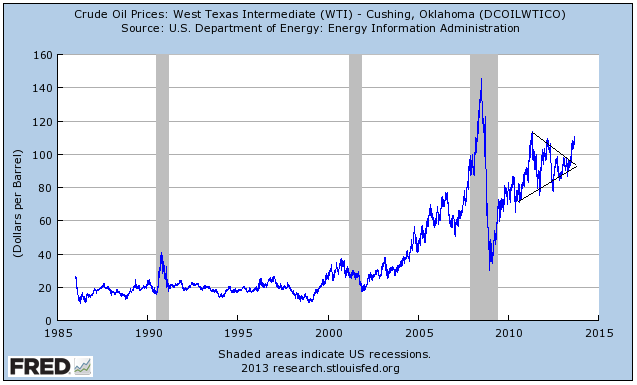 The twin threats to the economy are rising yields and rising commodity prices, particularly oil. Yesterday the softer line on Syria produced a pullback in oil and precious metals, however the recent evidence has been for a shift in outperformance towards commodities and emerging markets, which would be in line with a cyclical topping process in equities. If I am correct about the cyclical top in progress, then we should see commodities quickly come back, regardless of Syria, and energy stocks and materials stocks lead the way in this new leg up in stocks. Below I show the SP500 and the last two cyclical bull topping processes. The new upleg we are seeing now in stocks should be contained within the boxed range, if this is a top. Meanwhile on gold, the GLD ETF shows a fairly tidy picture. Either gold has been turned away at resistance in a continued declining trend, or it is shaping up for an inverse head and shoulder pattern with an obvious horiztontal support. Resolution one way or the other should occur soon. The Nasdaq has broken out and the Dax is flirting with new highs. Marginal new highs would befit a topping process, breakaway would not. I still give higher probability to an overall multi-month topping process due to evidence recently presented (such as breadth divergence, transfer to late cyclicals, technical shaping), however if leading indicators stay strong and early cyclicals regain momentum or other such developments, then I would be open to cyclical bull continuation. However, I maintain that rising yields and/or escalating commodity prices are more-potent-than-usual threats to the global economy due to the particular demographic-related fragility. Strong leading and coincident data as we are seeing can push up yields and commodities, and this is what I expect to continue. Neither have risen enough so far to put the economy at tipping point. Trading-wise I am sat on my hands at the moment. I await to see whether oil and gold can resume advances following yesterday’s puncturing. I believe equities can rise further towards the top of the range so do not yet want to take long profits or add to short positions. I await the FOMC output next week and more importantly the market’s reaction. 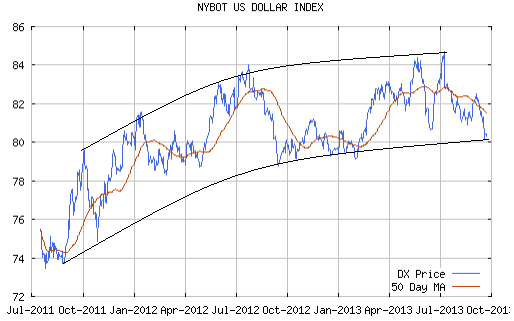 I am also watching the US dollar for resolution. No real up move in equities into the new moon / end of lunar positive period, but US indices have potentially carved out a rounded bottom the last couple of weeks. Commodities pulled back overall, particularly precious metals, as the US dollar mustered a rally. Gold and silver were at some point going to take a break after a 20%+ rise off the lows, so it’s what happens next that’s important. 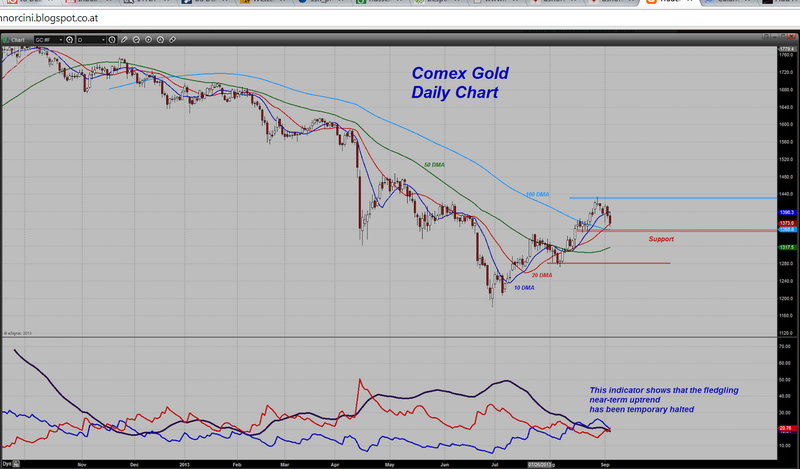 My target on gold and silver remains a retest of the breakdown – on gold this would be the 1450-1550 area. I would then take half profits. 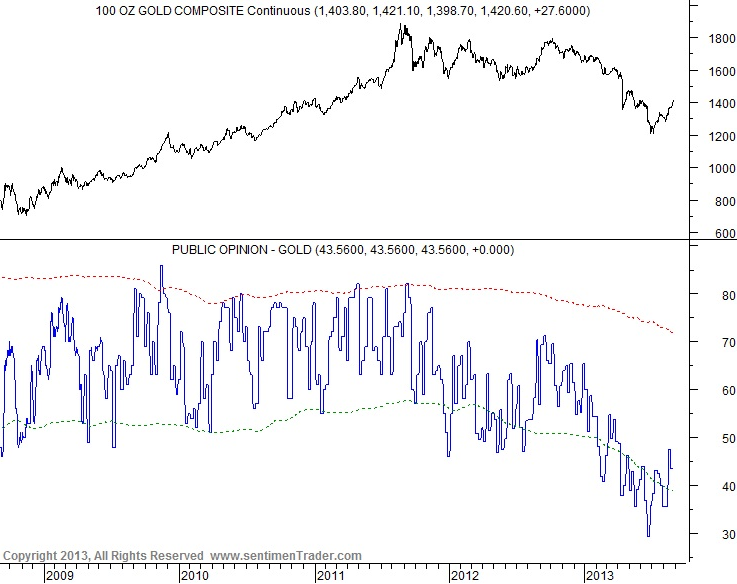 So, I am looking for gold to make a higher low and continue the uptrend in due course. The US dollar is at an important juncture. A breakdown would fit with a commodities rally. A break-up could be enabled by tapering. Syria action and Sep 18 FOMC expectations are going to remain in play next week. Regarding prospects for September tapering, the economic data has been overall good. Here the latest ISM composite for the US. 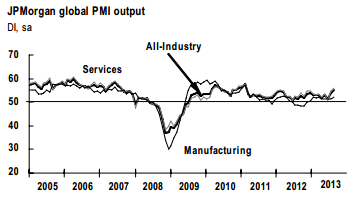 Global composite manufacturing and service PMIs also came in overall very healthy this last month. Although there remains the divergence between developed and emerging economies. Russell Napier’s stock market history work states that cyclical bulls have typically ended with the over tightening of yields together with excessive inflation. Yields may still be low by historic norms, but they have doubled from the lows in the last 4 months and we should not expect historically normal higher yields in the current environment of high debt and negative demographics. So, this doubling has been bad for the housing sector and other interest-sensitive groups. Excessive inflation has not yet materialised, and the fortunes of oil are key to this. It still looks technically strong and has the 2011 highs within its reaches, so that missing problematic inflation may arrive. The key is “excessive” inflation and “overtightening” of yields, i.e. it has to be set against the economy. A strengthening economy can cope with higher yields and higher inflation, but not if it starts to weaken or if the latter two rise too far too fast. Moneymovesmarkets still see evidence in global narrow money for a turn down economically by the end of the year. This may provide the window over the next couple of months for commodities to gain momentum, we shall see. 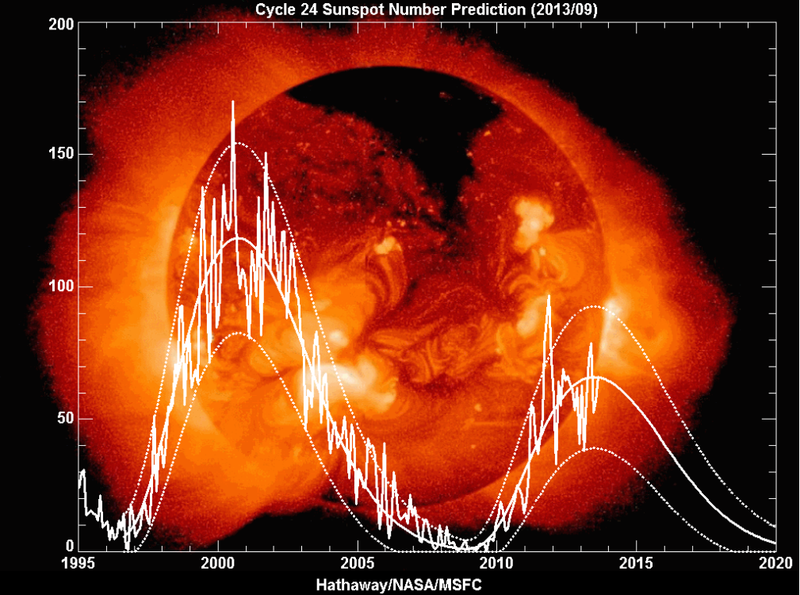 Playing in to that is the solar cycle. Here is the latest NASA forecast, and they are sticking with a summer peak. For a higher smoothed max we would need to see a rapid uplift in sunspots now, but that depends if their forecast is more accurate than SIDC’s, so let’s see. 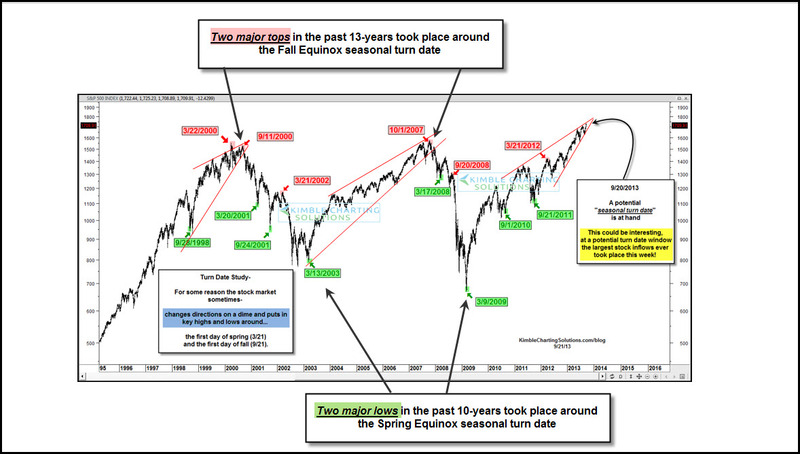 Is this a cyclical top in equities, the end of the bull market since 2009? If it is, then by the normal topping process, bonds should have topped, stocks should be making a topping range over several months, and commodities should take over and top last, if we are to comply with historic norms. On the below chart the CCI commodities index is in green, the MSCI world stock index in orange and 30 year treasury yields in red. Treasuries look like they topped in mid-2012 (yields inverted), and if equities are topping out then I have extrapolated how I see things should unfold. A completion of the topping range for equities, with at least one more rally up, and that rally being weighted towards late cyclicals, such as energy producers and basic materials companies, as commodities themselves outperform, to ultimately make their top as the economy tips over. 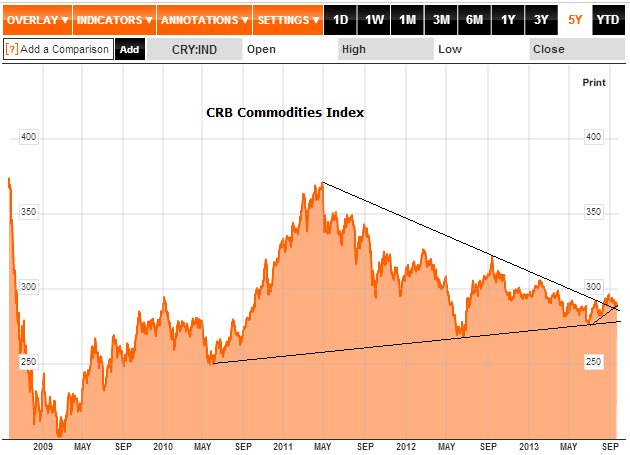 The next chart shows a longer term picture of the CRB commodities index versus the SP500. I have highlighted the last two cyclical tops, showing the multi-month topping price ranges in boxes and the lagged commodities peak in both cases shown by the lines. We potentially have the first half of a topping process on equities now, evidence for which I will detail next, and we see the commodities index tentatively turning up. 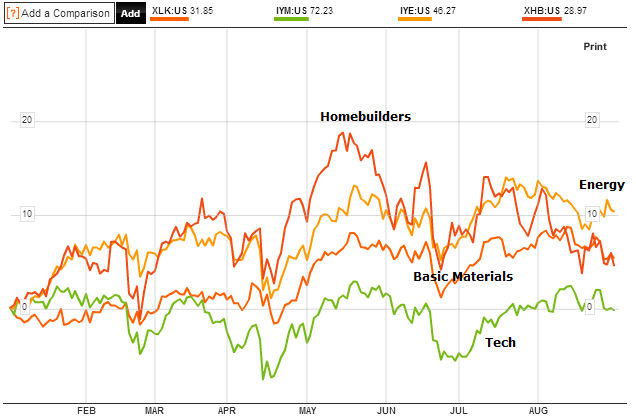 We can see that since the start of the year Tech has performed flat whilst Homebuilders have been on the decline since the May peak. Energy has taken over, but Basic Materials have not yet joined. Drawing in other early and late cyclical sectors, the overall picture is one of a shift from early to late sectors to some degree, but tentative. I would like to see a more compelling shift develop to add futher weight. Also in a topping process we typically see 90% distribution days and a shift from stocks making new highs to stocks making new lows. We saw such a 90% down day last week, but do not see strong evidence of a shift to percentage new lows. 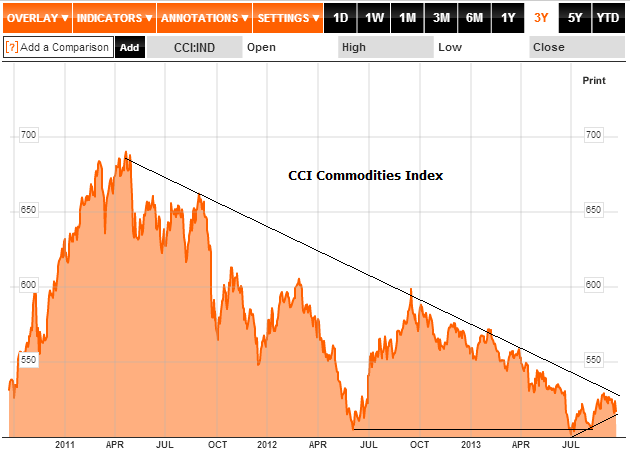 What I believe should occur is that commodities start to make strong gains here, taking the reigns as late cyclicals. Stocks should rally again, with the commodity related companies providing the thrust. Then inflation starts to be evident, and a demographically-challenged global economy starts to roll over in leading indicators, at which point stocks end their topping process and begin to decline, whilst commodities go rally to a peak in early 2014. In short, it would be historically normal for commodities to outperform here and in doing so puncture the global economy (which is weak due to collective demographics), which would tip over collective leading indicators into the negative. If this is a cyclical top in equities, then all this should happen promptly, i.e. this thesis should be quickly validated or invalidated. Chris Puplava speculated that the US Dollar could break down from its range. Such a development would also likely be a catalyst for commodities. But, the FOMC output in the middle of this month, with potential QE tapering on the cards, is likely to influence the markets, as will developments regarding Syria. Nonetheless, I would take the stance that either a normal commodities late outperformance and broad rally is on the cards, or it isn’t. I.e. QE and geopolitical will provide short term movement, but I’d suggest won’t ultimately decide the course. I see increasing evidence that we are seeing the pieces fall into place for a commodities sustained rally, but again note the disclaimer and also note the timescale I believe is applicable, i.e. it should happen without delay, and the recent upmoves in precious metals and oil should continue shortly and spread over to other commodities. So, until or unless commodities, particularly oil, start to rally hard, I would side with Japanese equities breaking upwards. However, if US stocks are making a cyclical top then I would expect global equities to turn down once the topping process is complete and I would not see Japanese equities going the opposite way. 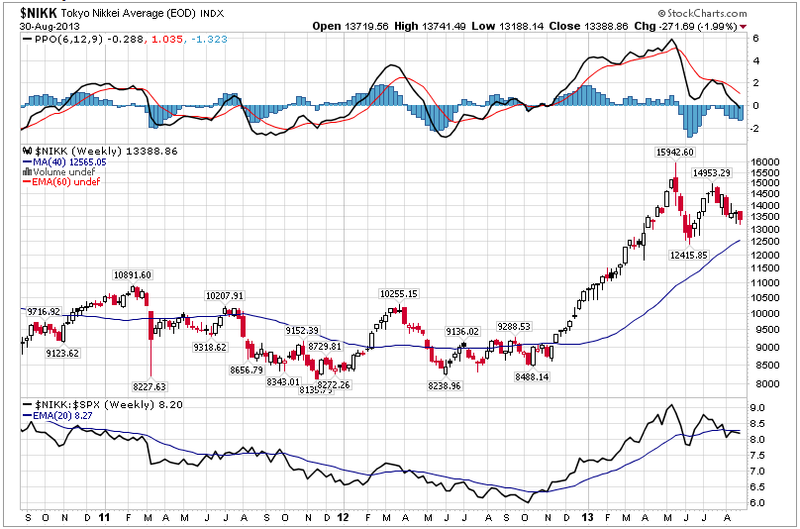 Once again though, if US equities are making a cyclical top then we should see commodities rally again to provide the tipping over, and Japan would then suffer accordingly. In short, I will hold off adding to my single Japan long position, pending further developments. This week we have the new moon on Thursday and the end of the lunar positive period at the weekend. I expect stocks can mount a rally this week and that may well be the next leg up in the topping process. I have updated all models this morning and the geomagnetic forecast for the next 3 weeks is overall down to flat.